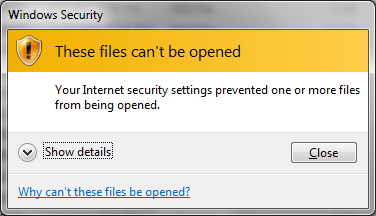 Your Internet security settings prevented one or more files from being opened. I search for the internet for the solution but couldn’t get any help. Though I tried different solutions, it was unable to work for me. After that I tried to system restore but unfortunately I didn’t had any restore point nearby date. So I had a great problem with my PC. I then inserted a new USB device and the same dialog box appeared then I thought that I will never had any new device installed on my PC. But I have thought of a solution for the Devices to get installed while those error shows. What you do is to follow a silly process. Restart your PC while inserting the device on your PC. Then boot the system, the device will be automatically be installed. That’s just a simple trick that may help you. But the process doesn’t work with the applications. I had winrar installed and I cannot directly extract the file by right clicking the file and extract the desired files. But I can open the file and extract the file. But for the applications to run you can open “cmd” and then go to the location/folder path and run the desired file easily. Hope this solution worked for you.